William Singletary, Class of 2013 (top row, third from right) led AUP Unit at The Citadel to be one of the most respected and successful in the nation. BM3 Singletary, USCGR, serves at Station Charleston, SC and will soon continue his service as a member of the AUP staff. Mike Piantedosi, Class of 2013 (right), served as Deputy Unit Leader at AUP Unit William and Mary before transferring to the Coast Guard Academy, from which he graduated on May 22, 2013. ENS Piantedosi will soon report to a Coast Guard Cutter home ported in Miami, FL. 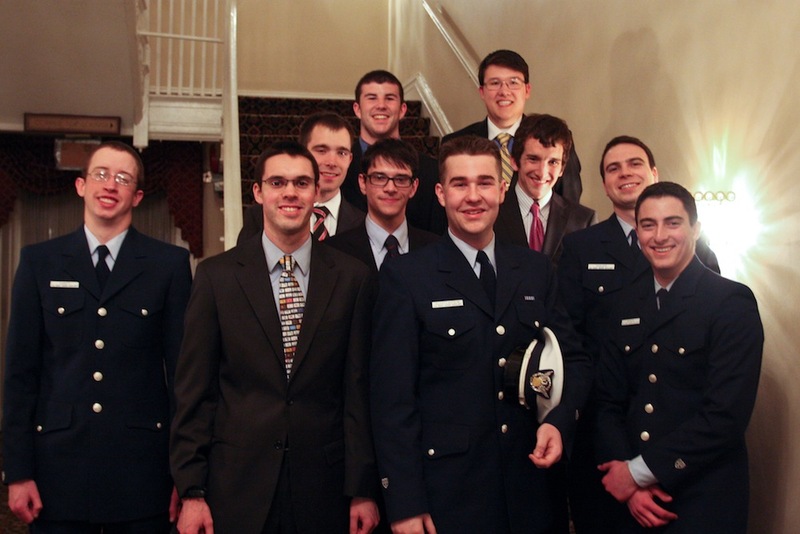 Jesse Thrift (bottom left), Cole Ashcraft (bottom, second from left), and Jacob Thayer (second row, far right), all class of 2013, were "plank owners" at AUP Unit Washington DC. Mr. Thrift is off to serve as Communications Officer with Flotilla Northern Virginia; Mr. Ashcraft will serve as Unit Officer at AUP Unit Washington, and Mr. Thayer, who will attend graduate school at the University of Texas, Austin, has already begun service as a Project Manager on the AUP national staff.